The new Spectral Instruments Series 600 camera mounted on the Ritter échelle spectrograph. The silver hoses are the refrigeration lines to the Cryotiger. Ritter Observatory is located on the campus of The University of Toledo. The telescope is a 1.06-m, f/8 Ritchey-Chrétien reflector manufactured in 1967 by the Warner & Swasey Co. of Cleveland, OH. In the 1980's, it was retrofitted with computer-controlled stepper motors in an open-loop control system. Star acquisition and manual guiding on the fiber are carried out by means of a CCD camera, SBIG model ST-9. 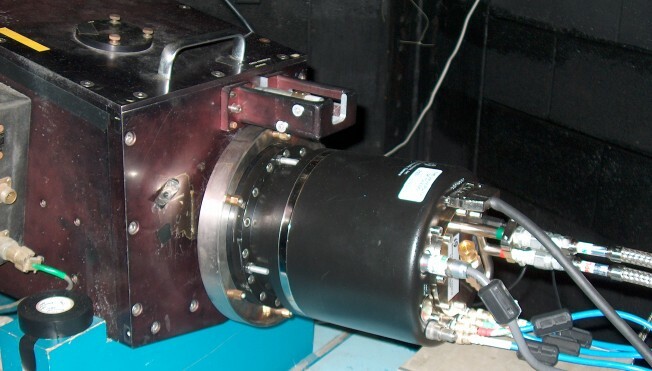 The spectrographs are connected to the Cassegrain focus of the telescope by fiber optic cables with core diameters of 200 µm. 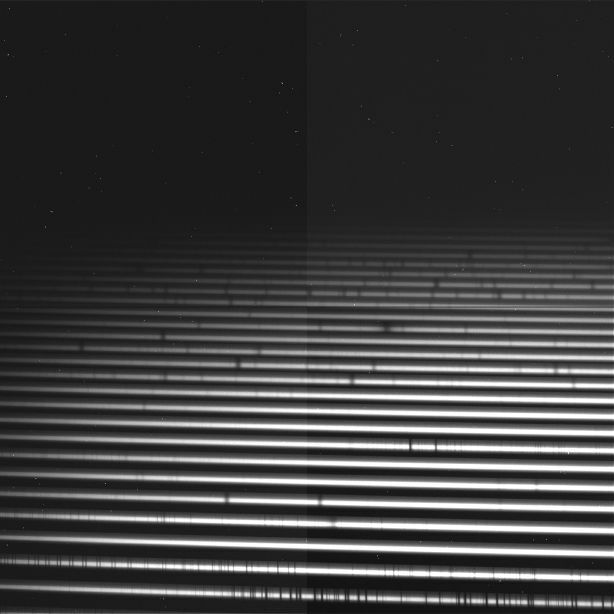 At any time, either a high-resolution échelle or a low-resolution, single-grating spectrograph can be selected. The échelle spectrograph was built in the mid 1970's after a design by D. W. Latham (Harvard-Smithsonian CfA). Nowadays, it is usually employed at a spectral resolving power of approximately 26,000 in the H alpha region. With support from the NSF-PREST program, a large-format CCD has been acquired. It entered routine operational status on 14 April 2007. This device is a CryoTiger-cooled Series 600 camera from Spectral Instruments, Inc. (Tucson, AZ) with a front-illuminated Imager Labs IL-C2004 4100 x 4096 pixel sensor (15-micron pixels). With 2 X 2 on-chip binning, the spectrograph entrance slit projects to a resolution element about 3 pixels in width. A Lumigen dye coating enhances the CCD's sensitivity to blue photons. Compared to the old camera (described below), wavelength coverage is greatly extended, covering about half the spectrum from about 4600 Å to beyond Hα at the grating settings normally in use. There are about 21 useful échelle orders, each about 150 Å in extent. In hot star spectra, Hα, Hβ, and He I λ6678 are all included, as well as many other lines of interest. With adjustment of the grating tilt settings, the entire CCD spectral range is accessible. Here is the first scientific image taken with the new camera, displayed in a partial screen grab from Spectral Instruments' image acquisition software, SI Image. The grating tilt settings have since been changed, the échelle slightly and the cross-disperser a lot. Wavelength region: red-yellow; the strong absorption line just below center is Hα. Wavelength increases downward and to the right. As of fall 2010, an atlas of the Th-Ar comparison lamp spectrum (PDF, 884 KB) has been completed, covering the spectral range 6825 through 4100 Å, the range of our standard "Hα" grating setting. The lines used for a calibration are a small subset of the KPNO line list and are listed in this file (text, 2 KB). Although this spectrograph system is mainly red-sensitive, wavelengths as short as 4100 Å are accessible in heavy exposures of hot stars. Below is a spectrum of Deneb taken with the standard "Hα" grating setting. Wavelength region: red-yellow; the weak absorption line in the middle of the second \'echelle order from the bottom is Hα. Wavelength increases downward and to the right. From 1993 until mid-April 2007, the detector was a front-illuminated, thick CCD manufactured by EEV, with 1200 × 800 pixels of dimensions 22.5 × 22.5 µm. It had a dye coating that enhanced its sensitivity to blue photons. It was packaged in a camera system by Wright Instruments Ltd. and was liquid-nitrogen cooled to an operating temperature of 140 K. It has now been retired, but it is described here for the purpose of supporting archival data. At R = 26,000, the entrance slit of the échelle projected to a width of about 4.3 pixels, and therefore the data are oversampled. Between 1997 April 8 and 1997 July 25, échelle observations were made with a narrower entrance slit, which gave R = 50,000 (2 pixels) and a corresponding loss in throughput. At the usual grating settings, H alpha is in the center of the lowest-numbered order on the CCD. Eight additional orders are included on the chip as well, with a free spectral range of about 70 Å per order. 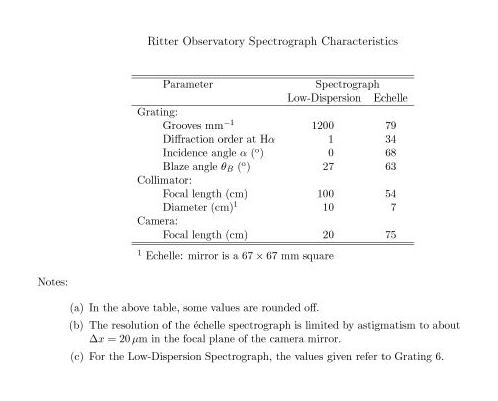 The table below gives the wavelength coverage of this CCD at this grating setting, and the figure [to be added later] shows a raw spectrum of an A-type supergiant star with prominent lines labeled. In a one-hour integration in good conditions, spectra with signal-to-noise ratios of 100 or better per pixel were routinely obtained for stars as faint as V = 5.5. Fainter stars were observed with correspondingly lower signal-to-noise ratio. Repeated observations of IAU radial-velocity standard stars, mostly 5-minute exposures, gave a standard deviation of about 0.2 to 0.6 km s-1, depending on the star. The standard epsilon Leo consistently gave the smallest standard deviations. Most radial velocity standards are slightly variable. Comparison lamp exposures were not simultaneous with science exposures but were made before and after. Therefore, a factor limiting radial velocity precision for longer exposures was positional shifts of the CCD, mainly caused by thermal shock at the time of liquid nitrogen fills. Position measurements of comparison lines over durations of ten hours or longer typically showed a steady drift between nitrogen fills, with position changes up to several tenths of a pixel during the course of an hour. The gain and read noise of this CCD have been derived from flat lamp exposures made at various times while this camera was in use. Uniform interorder regions were studied according to the method given by Howell (2006; Steve B. Howell, Handbook of CCD Astronomy 2nd ed. (Cambridge)). Before the readout electronics were overhauled in the summer of 2000 (following a hardware failure), the method yielded gain and readout values similar to those provided by Wright Instruments, namely 4.8 electrons per ADU and 12 electrons rms, respectively. After the summer of 2000, the gain was slightly higher, 6.2 plus or minus 0.5 electrons per ADU (standard deviation of 6 measured values). Repeated measurements on the same night in 2000 show read noise values much lower (6 to 8 electrons rms) at the end of the night than at the beginning (18 electrons rms). The readout noise may have been a function of temperature. Pixel noise in this CCD was significant, about 1% per pixel rms. Flat fielding removed most of this noise, usually yielding approximately photon-limited performance. The Low-Dispersion Spectrograph was designed by B. W. Bopp. It is a table-mounted, fiber-fed spectrograph with a Nikon 200-mm lens as the camera. It has a selection of gratings that give resolving powers ranging from about 1,000 to about 6,000, with the highest-dispersion grating currently the default. The thinned, back-illuminated CCD has 2048 × 512 20-µm pixels. It is installed in a spectroscopic camera manufactured by Spectral Instruments, with a water-assisted thermoelectric cooler operating at a temperature of -90o C. The dark current of this sytem has not yet been measured, as a minor light leak persists. Fringing has been noted in the background produced by the light leak, but its significance for spectroscopic observations is not yet known. It is not evident in the Hα region. At R = 6,000, the useful spectral range is about 700 Å, e.g., at H alpha, 6100 to 6700 Å. With our previous camera, we obtained spectra of stars down to V = 8 in an hour's integration, but experience is still too limited to quote a typical signal-to-noise ratio. This camera was in operation from May, 2004 through early 2010. The front-illuminated CCD had 1300 × 400 20-µm pixels. It was installed in a spectroscopic camera manufactured by Princeton Instruments, with a model XTE thermoelectric cooler operating at a temperature of -93.5o C. The dark current of this sytem was not limiting, permitting exposures as long as one hour. We did not actually measure the dark current, since the dominant contribution to the background in long exposures was illumination coming from electronic components at two corners of the CCD. Low-noise average images, made from long series of "dark" integrations during the day, are subtracted from the data to remove this background glow. This camera was replaced owing to a failure of the cooling system.